I have this bottle of nail polish that I have had since I was younger, maybe around 7 or 8. I really liked nail polish when I was younger, but I was also a tom boy and that phase didn’t last long. But getting back into nail polish some ten years later I rediscovered my old stash. A lot of the polishes were long dried out, but there were about 4 or 5 that were still useable. One of those polishes was from Bath and Body Works and it was called “Lucky Penny.” It was literally the color of a penny and was one of my favorite colors to wear back then, and turned into one of my favorite colors now. I loved that color but being extremely old it was also really thick and hard to work with. I have been on the hunt for a dupe every since. And I think I have finally found one! 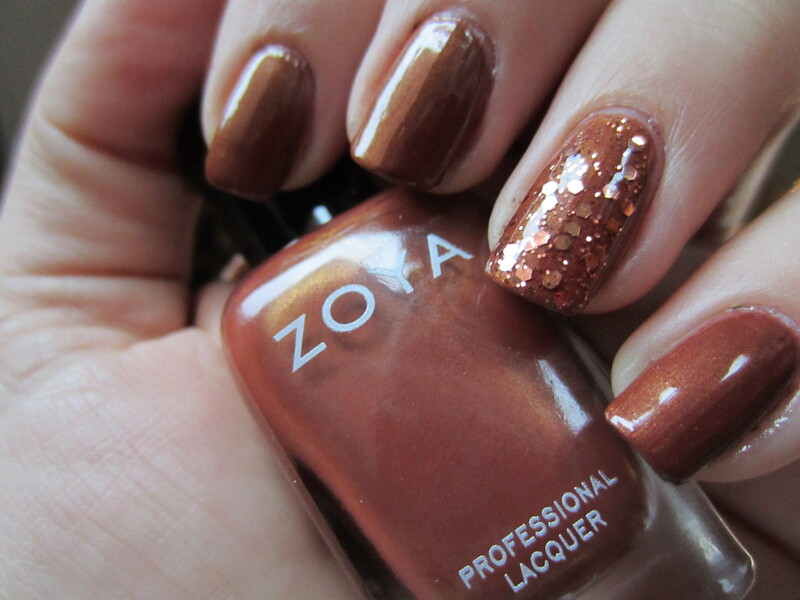 Zoya “Colette” is a rusty brown color that has a little bit of a gold shimmer to it. It looks just like a penny and I’m in love. It is almost an exact dupe of my Bath and Body Works color except that color had a little bit more shimmer and this one is closer to a cream. I am absolutely in love and this was exactly what I was looking for to replace my old bottle. That has since made its way to the trash, I was sad to part with it, but I’ve moved on to newer and better things! Then of course, I had to add some glitter because I’m a glitter type of girl. So I added Sephora by OPI “Traffic-Stopper Copper”. Awesome fall manicure! ← Broken Dark Doll Halloween Tutorial!